How did you first learn about post-graduate service? 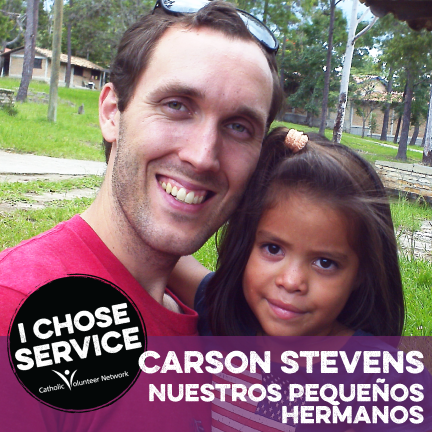 I knew that Nuestros Pequeños Hermanos served a lot of its functions with post-grad, international volunteers and met several people who had served in Peace Corps and that sort of work. What other options were available to you, and why did you decide on NPH? I did not look or consider anywhere else. I felt a calling to be at NPH for a year. Tell us about your service experience. I had the impression that most people applying to be a volunteer with NPH prefer countries besides Honduras due to the public perception of safety concerns there. Because of a personal connection, I wanted to go to Honduras. That being said, NPH tries it best to put someone WHERE they want, doing WHAT they want to do. However, some of the most successful experiences are doing SOMETHING SOMEWHERE one does not request/expect to find success in. What benefits have you gained from this experience that you might not have received otherwise? I was able to improve my Spanish speaking skills from very low to pretty competent, work with wonderful kids of different ages and abilities and learn about a culture completely different than my own. I found myself somewhere where religion (Christianity, though as Catholic as I had grown up thinking Central America was) is central to almost everyone´s life…something quite new for me. What advice do you have for someone considering post-graduate service? DO IT. I believe that post-graduate service is the best thing one can do immediately after graduation for several reasons. One, service in a new, preferably foreign, environment forces one to leave their comfort zone. The departure from one´s comfort zone will create growth that is not easily acquired in any other experience. A foreign language is a great example: you adapt to your environment because you HAVE to. Not having a choice in the matter has a certain charm, and it actually takes the pressure off. Two, service to OTHERS can be very rewarding. Doing something that is asked of you instead of what you want to do can be quite humbling as a Westerner…making it that much more valuable. Three, do it now because it can lead you to your “CAREER” a lot better informed and skilled than if you had not done it.